Discussion in 'Health and Quackery' started by Rory, Nov 30, 2018. An old and persistent myth is that the lunar cycle and the human menstrual cycle are (or should be) connected and synchronised. While many studies have shown this idea to be erroneous, others have appeared to support it. One of the most commonly cited is the study produced by Winnifred B. Cutler, PhD in 1980. In the autumn of 1977, Cutler selected 312 college students (aged 19 to 22) who recorded their menstrual cycles over a 14-week period. Of these 312, 68 (21.8%) were reported as showing "a mean cycle length of 29.5 days, plus or minus 1 day", and these were the subjects Cutler focused on. She noted that "47 (69.1%) menstruated in the light half of the month" and 21 (30.9%) in the dark half. This was seen as statistically significant (z=3.16, p<0.001). A pilot study carried out the previous year yielded similar results: 29 (22.8%) of 127 subjects showed a mean cycle of 29.5 days, ± 1 day, and of these 29, 22 (75.9%) menstruated in the light half of the month. 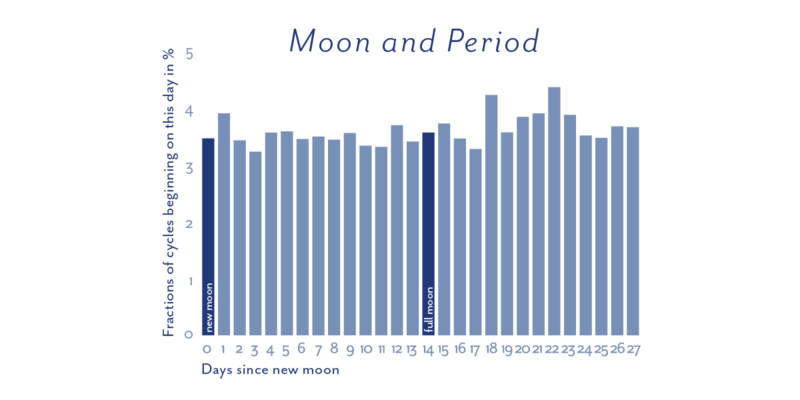 "Menstrual cycles similar in length to the lunar cycle in these selected populations [...] tended to occur during the light half-cycle of the lunar period. Thus, ovulation is occurring in the new-moon part of the cycle and is coincident with the greatest gravitational pull on earth." "Since the average lunar cycle is 29.5 days and the average menstrual cycle is also 29.5 days, the many conjectures of a lunar menstrual relationship [...] did make sense." 2. Data is cherry picked, the analysis is poorly executed, and it's apparently biased towards a predetermined outcome. There are quite a few examples of this, which I'll detail in the post below. "no correlation between the lunar phases and the menstrual cycle or period start date. Period start dates fall randomly throughout the month, regardless of the lunar phase". Interestingly, they also note that "the global average menstrual cycle length is 29 days", as opposed to the commonly held belief of 28 days, and that "Statistically speaking, with a random distribution of period start dates, about 1 in 2 women will have their period start ±3 days from either the full or new moon" - which may go some way to explaining why some still feel there is validity in the notion of a connection between the menstrual cycle and the moon. The 78.2% of subjects whose menstrual cycles didn't show a mean cycle length of 29.5 days, plus or minus 1 day, were discarded from the data which informs the conclusion. Cutler writes that "data contamination with cyclers of other than approximately 29.5 days would hide any demonstration of a high incidence of menses onsets in one phase of the lunar cycle" - which seems an extraordinary statement of bias and evidence suppression. In a nutshell, it's akin to saying "menstrual cycles are the same length as the lunar cycle - if we ignore all the ones (78%) that aren't"
I'm sceptical about the "29.5 days plus or minus one day". Does this mean she only counted those whose cycles started less than 24 hours either side of 29.5 days? Or would she have counted a subject, for example, who began a period at 7am on October 1st, and then again at 8pm on October 31st - i.e., 30 days later, but not between 28.5 and 30.5 days later? I suppose some may think this lack of a lunar connection takes something away from life; but I would argue it adds to it. Through personal interaction and reading online, I've seen that some experience a pressure to align their bodies with the moon, and a sense of disappointment that there may be something wrong with them if this isn't the case; as well as the feeling that there's something they can do to change this - which I imagine will usually be both fruitless and only add to a sense of disappointment. Knowing, however, that there is no "biological or cosmological standard" and that "normal" encompasses a huge range of cycle lengths and variations could, I feel, be quite liberating. Given that the most recent evidence with a very large sample size points to no correlation between the menstrual and lunar cycle, it’s unlikely there’s a connection. However, if you’re on a White Moon or Red Moon Cycle, that’s cool - especially if you derive personal meaning from this experience. But if you’re not on one of these cycles, there’s no need to worry. "Your menstrual cycle might be regular - about the same length every month - or somewhat irregular," write experts at the Mayo Clinic. "Within a broad range, 'normal' is what’s normal for you." As we can see, the numbers involved are not only tiny, but often zero - so it is little wonder that statistical anomalies were found. Is there really no link? 1. Investigative data: Among the 826 female volunteers with a normal menstrual cycle, aged between 16 and 25 years, a large proportion of menstruations occurred around the new moon (28.3%), while at other times during the lunar month the proportion of menstruations occurring ranged between 8.5–12.6%; the difference was significant (p<0.01). 2. Laboratory findings: The 6-hydroxymelatonin levels in the urina sanguinis of 3 female volunteers reached their zenith prior to and during menstruation, gradually declining to their nadir during ovulation. The difference in 6-hydroxymelatonin between menstruation and ovulation was significant (p<0.01). Two of these three volunteers had their zenith in the period of the new moon and nadir 3—4 days prior to the full moon respectively. 3. Clinical experience: The lunar-menses-regulatory therapy in treatment of Nephropenic secondary amenorrhea revealed 4 clinical cure, 5 marked effect, 8 menogogue and 3 inef-fect out of 20 cases. Have you looked at the raw data for that study? What does "around the new moon" mean? Is there any evidence of bias? Even just going by the abstract, what it shows is: 1. the exact opposite of what Cutler believed she had found; and 2. a disagreement with a sample size of 1.5 million. Have you looked at the raw data for that study? self reported Chinese study published 1986 in a scandinavian journal with an impact factor of only 2.4 (New England Journal of Medicine is impact factor 79). It doesnt seem they recorded data for consecutive months. Again sounds self reported girls and yound women aged 16-25. No breakdown of ages. Methodology information lacking. The "cure" is silly. they dose the women with drugs at certain moon times, but there is no control group or testing of a group (group is n=20) giving drugs at different times. So that data is worse than useless as far as lunar connection. And while googling that i ran across a related 'myth' that more babies are born during the full moon period. I think this is closely related enough to add to this thread. page 3 of this article linked then gives more studies (looking at large populations)that do not show a link. "Statistically speaking, with a random distribution of period start dates, about 1 in 2 women will have their period start ±3 days from either the full or new moon." If statistics predict 50% of women will menstruate ±3 days around either the full or new moon, I suppose we can logically deduce that 25% would be predicted to menstruate around either - which is not so different from the 28.3% the SP Law paper declares. That said, this apparent correlation is most likely a coincidence - Law has only 11.5% occurring around the full moon - and the paper really falls foul to the same statistical shortcomings that Cutler's does. I think sample size and methodology are the key issues here. Both Cutler's four studies (when combined) and Law's study use over 800 volunteers to gather data. That might seem like a lot but, as an example of why a sample size of even several hundred is an insufficient number on which to base a conclusion, I just looked at which month my facebook friends' birthdays fall in. 351 share their birthdate information, resulting in an average of 29 birthdays per month. In July, however, there were only 19, while in October there were 38 - quite large statistical variations. It's interesting that a PhD such as Cutler, who does apply statistical analysis to her data, could get it so wrong. 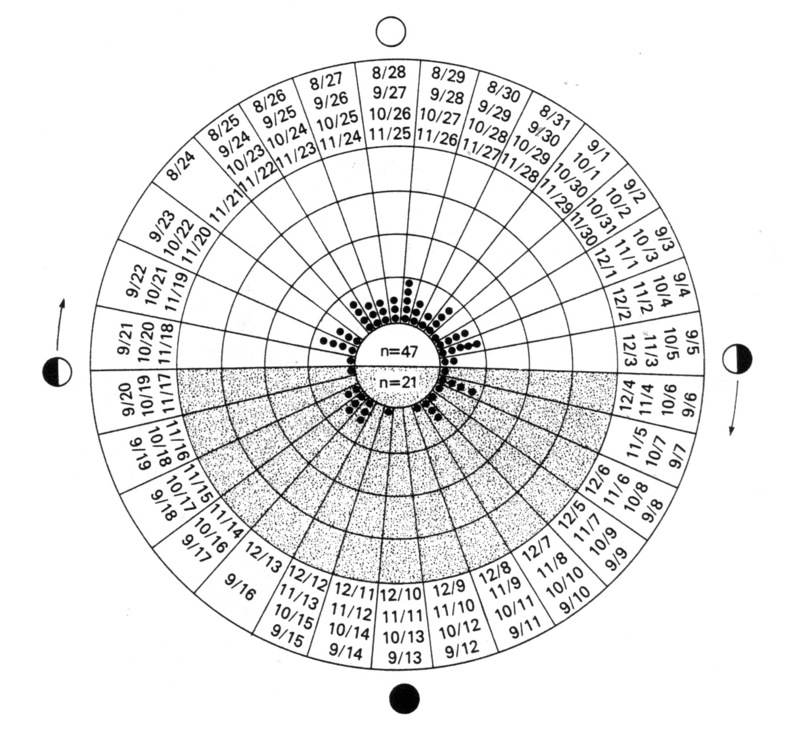 A random distribution [of cycle dates] would yield a flat density since it would be equally likely for women to begin to menstruate on any day of the lunar cycle. A departure from a straight line thus indicates non-randomness. Under the assumption of the null hypothesis, in this binomial situation, one would expect one half of the entries (one half of 68) to fall in each half of the lunar cycle. In a nutshell, she imagines that, were menstruation random, every day of the month should return the same total, and that even with a sample size of only 68, a balanced spread should be observed. Actually, the opposite is true: for example, the chances of randomly selecting 31 people and finding they were all born on different days of the month is fantastically small. Likewise, given a similar sized binomial situation I wouldn't ever expect a fifty-fifty outcome - the odds of tossing a coin 68 times and it not landing 34 times on each side are a whopping 93.2%. As the Clue data shows, "a departure from a straight line" is exactly what we ought to expect from the randomness of the natural world. Apart from the fact folks get horny at Christmas. Naw, October babies are conceived in January/February. Christmas holidays are the reason most babies (in Christmas-celebrating countries) are born in September - even in Australia. However, menstruation cycles in other mammals are longer or shorter. Is there something special about us humans ? Is there a tendency or bias among people that wants to link us, to the Moon or the heavens ? .....and helps us "search for similarities" in the data ? Astrology and religious or spiritual thinking, demonstrates there has always been a yearning for a connection to the heavens (sky, moon, sun, stars). so cold winter nights in the north and sultry summer passion down under. It's more likely the same reasons in the Southern Hemisphere as it is in the Northern - Australia's three most popular birth months are September, March, and February. So Christmas holidays followed by winter snuggles. In the north we get the double whammy of Christmas and winter combined. Yep. As mentioned above, with reference to mammals that menstruate in similar ways to humans. This list, however, is of mammals' estrous cycles, which is something different. Is there a tendency or bias among people that [...] helps us "search for similarities" in the data? Which "similarities in the data" do you mean? Apart from when sample sizes are too small, there don't seem to be any similarities, patterns, or significant anomalies, as far as this proposed connection is concerned. There does definitely seem to be a tendency among some people to want to believe there's a connection between the moon and certain aspects of human life, which I suppose is fueled by a mixture of confirmation bias, pattern seeking, anecdotal evidence, and desire for meaning. So Christmas holidays followed by winter snuggles. Well my folks always said I was the product of the winter of 1963. I ran across a related 'myth' that more babies are born during the full moon period. I think this is closely related enough to add to this thread. Page 3 of this article gives more studies (looking at large populations) that do not show a link. Checking in on that, I found that by far the largest study done did claim to show a link - a 1998 paper produced by an astrophysicist team at Appalachian State University, looking at data for over forty million live births, and published in I.A.P.P.P. Communications (NASA/Harvard affiliated?). Rather than a spike around the full moon, though, the paper states that peak birthrate was found to be around 21 days (third quarter) and minimum near day 7 (first quarter). It seemed that the writer(s) were somewhat surprised by these findings; as was I. But given the establishment, the lack of obvious bias, and the sample size, it seemed worth looking into. Anyway, I found daily birth statistics for the US from 1994 to 2014 and just finished cross-checking them with the lunar cycles for those years - 89.5 million births over a total of more than 250 lunar cycles: most likely the largest analysis on the subject to date. Result: it's basically a flat-line graph. without looking at the paper now.. so the link wasnt for births at the full moon. the link was for the third quarter? That's what they put forward. But there's no correlation from the data I've checked. Not sure where they went wrong. Not sure where they went wrong. what makes you think 'they' went wrong? Looks like pregnant women are crossing their legs and holding on during xmas and new year. Those look to be significant drops in birth rates! I've got a few jokes I could make here, but I'll just be sensible instead. Less hospital staff working, and less c-sections scheduled (in UK and US that accounts for ~25 and ~35% of births respectively) - same reason why weekends are always lower. In order from left to right: New Year's Day; April 1st; Memorial Day; July 4th; Labor Day; Halloween; Thanksgiving; Christmas; New Year's Eve. Surprisingly - as in the UK - the 13th of each month is markedly lower too. Not sure whether this is superstition on the part of the parents or the staff. Valentine's Day was another surprise - big peak compared to the surrounding days and weeks. Though part of this may be those skipping the 13th. I guess mostly because their results don't agree with reality, and then partly because their results didn't agree with other large scale studies, including bigger ones. Also it wasn't really presented in a very convincing way, and they expressed doubts themselves about whether they'd calculated the data right. Now I've found that one of the authors had redone the study a few years later, with improved methodology, and concluded that there was no correlation after all. Not before I'd completed my own ginormous analysis and write up though! Is it common knowledge that less people are born on the 13th of each month? I'd never known that till I made these graphs. It's not just Fridays either. And a product they were proud of, I'm sure. Hi, fascinating discussion. I signed up here just to chime in. This is timely, as I was recently told that the slaughter of pigs to coincide with the phases of the moon are important for optimal flavour. This was by a female chemist, who assured me that she could feel the influence of the moon on her body (I assumed to do with water retention, but didn't want to pry for fear of being creepy). I couldn't argue with her personal experience, as I had neither my own personal experience nor scientific data. Now I have the latter. I have a few points to contribute, that don't seem to come up in all the usual places where this is discussed. If anyone can point to authoritative references to support (or refute) these, I'd be grateful. My first point is that "full moon" doesn't mean "maximal gravitational influence of the moon". The amount of light falling on the moon doesn't change how much pull the moon exerts. So during a lunar eclipse, the tides don't suddenly drop. The second point is the misunderstanding that gravity somehow acts on water only, or somewhat more than other (dry) matter. Gravity acts equally on all matter of equal mass, regardless of the molecules that make up the matter. The third point is a corollary. At the location of high tide, where the moon is directly above the peak of the tide (yes this is not quite true, but I'm simplifying for the storyline) the moon would exert equal pull on the water as it would on the ground directly beneath that water. Unless the body of water is relatively deep in relation to the distance to the moon, the differential will be practically zero. Therefore, any pull on the water would produce an equal pull on the ground below, and any caused motion of the water would be matched by the ground below. Another way to put this is that the earth is falling down the gravity well (towards the earth) just as much and just as quickly as the water above it. So a direct gravity influence on the world nearest the moon is not what causes the lunar tides. This effect, where equal pull on the water and the ground beneath, is negligible because the depth of the water as measured towards the moon's gravity well (or more correctly, the gravity well that is mostly influenced by the mass of the moon) is very small compared with the size of the Earth and the distance to the moon. Comparing the gravity differential between a molecule of water at the surface of the water and one at the bottom of the water would yield a non-zero result due to one being further down the gravity well, but the depth of even the deepest ocean is extremely small compared with the size of the earth and the distance to the moon. However, this is not the case at points 90% from high tide. At such points, a water depth measurement would be approximately at right angles to a line directed towards the gravity well. If we measure the water at one such points being the distance heading down the gravity well (or approximately, which passes through the moon), we aren't measuring the depth of the ocean, but some distance ACROSS the ocean. This would be a much larger distance, by possibly three or four orders of magnitude. And therefore, my fourth and final point is to assert that the effect of gravity on the tides is due to a sideways force on the water, greatest at points half way between the two tides, that are minuscule, but add up to displacement that exceeds that of the earth (remembering that the earth is pulled towards the moon also). All of those water molecules are giving tiny sideways "pushes" or "lean" towards the moon, and the accumulation of these trillions of trillions of leans in the same direction all add up to a measurable motion that is greater than that of the earth. On the non-moon side of the earth, the leanings towards the moon are less than the motion of the earth, causing the opposite bulge. Nice post, Jez, and welcome to the forum. That's true. The size of the moon's gravitational pull on earth will be as a result of distance, which changes by around 17,000 miles either side of an average of 238,000 miles. Relative position and distance to the sun are also a factor. The tidal misunderstanding is a good one, and the reason why a lot of people think the human body could be affected by the position of the moon. Your post makes me think that, for believers of a 'lunar effect', perigee and apogee of the moon would be a more suitable place to search for a correlation than lunar cycle. Though, as the data from Clue and the birth rate studies show, there's no evidence for a cyclical pattern of any kind. Yes C-sections plus scheduled inductions must make up to quite a proportion of births. Our second daughter was induced, do the date was planned. Our first daughter though came in the early hours of the morning (on my birthday!) and there was no choice in the matter! C-sections plus scheduled inductions must make up to quite a proportion of births. Disturbingly high - over 45% in some countries (emergency and recommended rate is around 10-15%). One of my biggest takeaways from researching this is to really question the statistics. A PhD puts out a paper, says "that's statistically significant", and throws in the old "p<0.001" and I might think, hm, no arguing with that. But the two papers above show very clearly how misleading this can be - even with a sample size of over 800. On my fourth click I got a result not far off Cutler's original study - 47 to 21 - which was given a P-value equating to "high statistical significance" - less than a one in a thousand chance of being wrong. Me too....I was born in the 9th month of 1963, so....conception was in late January, same year. For what it's worth, my close family friend is a retired primate researcher at Emory University. I emailed him for his thoughts on the study, and he consulted a colleague. Cutler is, IMHO, a non-scientist. Even today, she advertises *pheromones* in the back pages of the New York Review of Books. The menstrual synchrony - lunar menstrual cycle story is pretty unimpressive, in my opinion. When someone heavily filters the data, as Cutler does, and then comes up with a story that has not been corroborated even 4 decades later, then I think you can basically write the idea off. I have to admit that I don’t follow all of the twists and turns of the attached article’s criticism (I read it twice), but I have always thought the Cutler research (and a lot of other research in the area) was a fad.